A racist comment appeared on the Soundings exhibit at Jeffery Hall on Friday morning. 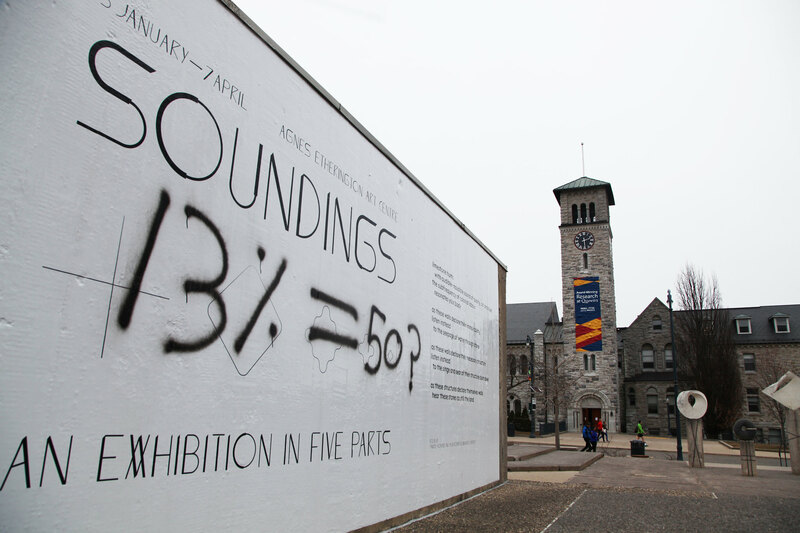 Overnight on Thursday, the Agnes Etherington Art Centre’s outdoor display of its Soundings exhibition—which features the work of Indigenous artists using sound as a call for decolonization—was vandalized with racist graffiti. On Friday morning, images began to appear online of the exhibit’s curatorial score outside Jefferey Hall, which had been targeted with black spray paint and racist language. The racist slogan—which read "13%=50? "—refers to a US Bureau of Justice statistic, citing Black offenders’ percentage of overall homicides in the country. The Black population in the US is estimated to be around 13 per cent. “There is no place at Queen’s for vandalism like this, nor for the hateful and racist messaging contained in the graffiti,” Teri Shearer, deputy provost (Academic Operations and Inclusion), said in a statement Friday. Kingston Police responded to the graffiti on Friday morning, along with several other incidents of vandalism on campus. According to several Facebook posts, the anti-Semitic phrase—“The Goyim Know,” with the Star of David replacing the second “o”—had been spray-painted across the sidewalk in front of Summerhill and on a wall at Mackintosh-Corry Hall. The phrase included the Hebrew word Goyim, referring to a non-Jewish person and promoting anti-Semitic conspiracy theories. Another anti-Semitic message—which read “USS Liberty”—was spray-painted on the sidewalk in front of Theological Hall. The phrase references a US navy ship that was accidentally attacked by the Israeli Air Force in 1967, who mistook the vessel for an Egyptian ship. The Israeli government apologized for the attack, and inquiries by both countries determined the attack was an error. Last week’s vandalism follows the appearance of a poster reading “It’s okay to be white,” discovered roughly two weeks ago at the bus stop in front of West Campus. The phrase is a popular tagline used by alt-right and white supremacy groups online. On Friday, the University released a statement reminding the community not to speculate as to who may be responsible. Campus Security and Emergency Services also published a statement on Friday, which said they were “aware of the multiple instances of spray-painted graffiti on campus, all racist and hateful in nature.” The statement urged anyone with information about the vandalism to contact either Campus Security or Kingston Police. As of Friday, Physical Plant Services have removed the racist graffiti from campus.